Award winning best selling author Robert J. Randisi returns to one of his most beloved mystery series. Set in the glitz and glamour of Las Vegas in the days when Sinatra was king, The Rat Pack Mysteries have taken Randisi’s Eddie G. on many a dangerous path where he’s met both the famous and the infamous. The eleventh in the series is no different and is packed with all the action and mystery readers expect. 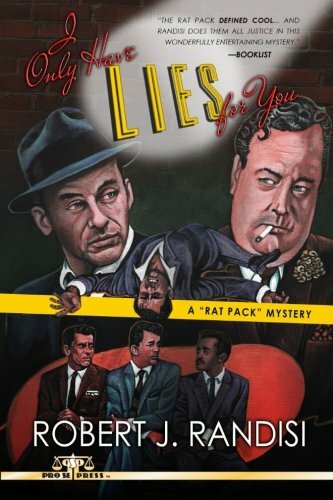 I ONLY HAVE LIES FOR YOU: A RAT PACK MYSTERY is available from Pro Se Productions in paperback, digital, and hardcover. By 1965, Eddie Giannelli has a rep as a “go-to” guy in Vegas...but Frank Sinatra takes Eddie away from home on a trip to Miami. When that happens, Eddie G not only pals around with Dean Martin and Sammy Davis, Jr., but gets the chance to meet “The Great One”, Jackie Gleason. Take a trip to sunny, deadly Miami in this latest tale of the Rat Pack by Robert J. Randisi, called “the last of the true pulp writers” by Booklist. Featuring an atmospheric cover by Larry Nadolsky, logo and cover design by Casey W. Cowan, and print formatting by Marzia Marina and Antonino Lo Iacono, I ONLY HAVE LIES FOR YOU is available now in paperback at https://www.amazon.com/dp/1986001490/ref=sr_1_2?ie=UTF8&qid=1519663515&sr=8-2&keywords=i+only+have+lies+for+you and Pro Se’s own store at www.prose-press.com for 17.99. The book is also available in hardcover for $40.00 at http://www.lulu.com/shop/robert-j-randisi/i-only-have-lies-for-you/hardcover/product-23539158.html. Randisi’s eleventh Rat Pack Mystery is also available as an Ebook, designed and formatted by Lo Iacono and Marina for only $5.99 for the Kindle at https://www.amazon.com/dp/B07B2YXVZN/ref=sr_1_1?ie=UTF8&qid=1519663515&sr=8-1&keywords=i+only+have+lies+for+you. This book is available on Kindle Unlimited, which means Kindle Unlimited Members can read for free. For more information on this title, interviews with the author, or digital copies to review this book, contact Pro Se Productions at editorinchief@prose-press.com. To learn more about Pro Se Productions, go to www.prose-press.com. Like Pro Se on Facebook at www.facebook.com/ProSeProductions.